First, a word of caution. As before, I have to entreat Breaking Ferriss readers not to visit the 80/20 Drummer site during this period, because one false “visit” could upset my metrics. Thanks! 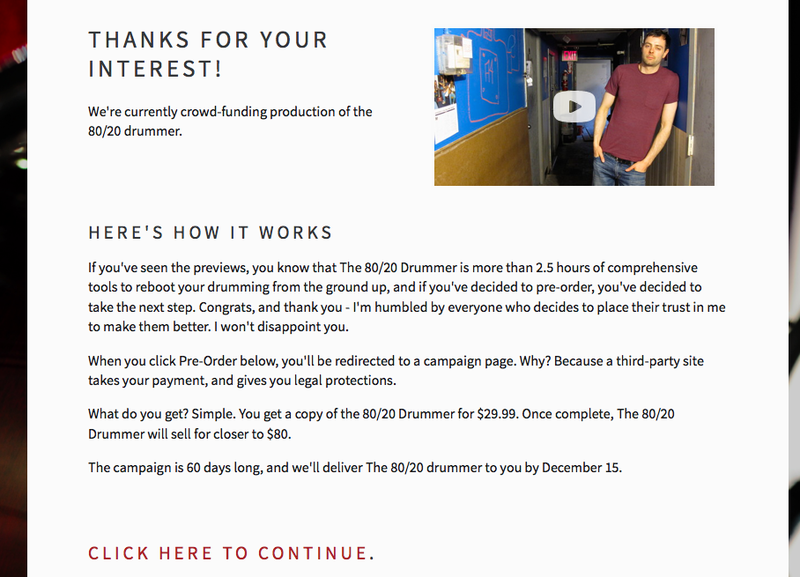 After receiving 4 “pre orders” in 4 days for the 80/20 Drummer, I decided that to continue “dry testing” (that’s advertising a hypothetical product and seeing what percentage of visitors to your site click “buy now” to gauge how sales you’d have before investing in a product) without adding the last parameter – crowd funding – would be a waste of money. Using the server logs, I was able to determine where each visitor who clicked “pre order now” came from, and it was a surprise. Facebook ads? Google adwords? Nope. Two of the four came from Youtube, one from Craigslist (which means he/she was interested in in-person lessons, but decided to order the videos instead), and the fourth from google – not from paid advertising but from a natural search. There are two sides to that coin. The good news is that I’m getting free traffic to my site that’s converting (going from “visitor” to “customer”) really well, which means I may be able to save on advertising. The downside is, unlike paid advertising, I can’t control the volume of traffic (by, for instance, doubling my ad budget for twice as many visitors on Adwords). Obviously, campaigns on Indiegogo and Fund Anything are 60 days in length. At the pace of one “order” per day, I could almost make my goal in 60 days, but first I need to test if a visitor learning “pre order” means crowd-fund changes conversion rates at all. My fear is someone will see “crowd fund” and be like “waaaaaaait a minute – your video isn’t even made yet?” As usual, I’m doing two things. First, I’m being completely transparent. Here’s the crowd-fund landing page. The page explains that when potential customers click to continue, they’re going to be redirected to a third-party funding site. I felt that would be less jarring than linking directly to Indiegogo from the “buy now” button on the main page. Personally, I’d far rather somebody leveled with me, and I the only site I can create as a “first draft” (before I market test it) is the one that would be most likely to make me buy. Crowd funding typically sets a funding goal (mine will be $2000) and awards “premiums” to people who “donate”. As the text explains, my “premium” will simply be a steeply discounted copy of the 80/20 Drummer. As such, it’s more strictly a “pre order” than it’s a donation, since the buyer will receive the product he purchased – at a discount – he just has to wait a few months. So here’s the second thing I’m doing. Dry-testing how “crowd source” affects the conversions. Will 100% of visitors who clicked “pre order” click “continue” after learning they’re going to Indiegogo to crowd fund the project? Probably not. I suspect that after a couple of days I’ll have a pretty good picture of the “falloff”. If it’s 75% that continues to crowd fund me, that’s pretty good, and I’ll be reasonably confident launching a real campaign. If it’s lower, like 25%, or – horrors – 0%, I might have to take a different approach. Remember, crowd-funding is just one idea I’m playing with. Another is the much simpler Tim Ferriss model of simply confirming the demand, investing up-front in video production, and making my money back with actual orders (at the highest price point, not at $29.99). We’ll get further into that, and why if you’ve got some liquidity the tax laws make such a minimal investment pretty “win win”, if crowd-funding turns out not to be viable. Also, I need to figure out how to increase my free traffic.